This tower, which I haven't identified, along with the one a bit further in the background, is easily visible from the Triumphal Arch of Pope Sixtus V. I was just too lazy and too hot to walk a bit further south to get a better look at it, but it looks like there's a travertine archway to the left of it in the photo, so it might be an old Gate in the Aurelian Wall (I'm probably wrong about this). 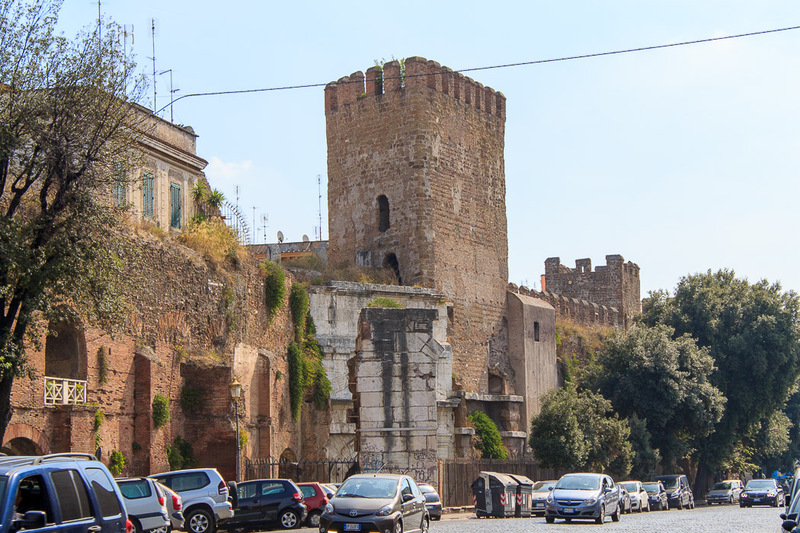 My internet searches turned up that the white building built on top of the Roman wall is Villa Gentili; I don't know whether the tower is related to that either. Also, there is apparently a third tower in this area, a block further south, where Via di Porta San Lorenzo intrersects Via Tiburina. See all Unidentified Tower photos.